Some in-vehicle technology has substantial benefits and has contributed to saving lives. Unfortunately, other technology has been damaging to safety and has helped to contribute to the biggest year-to-year rise in car accident deaths in 50 years. You need to understand what kinds of in-car technology puts you at risk and you need to make sure you do everything you can to keep your family safe from the dangerous risks of mobile technology behind the wheel. According to New York Times, there was a 10.4 percent jump in car accident death rates from the first half of 2015 to the first half of 2016. In January of June of 2016, 17,775 fatalities occurred in auto accidents. There has not been this substantial of an increase in death rates in decades, and death rates had actually largely been declining until recently. 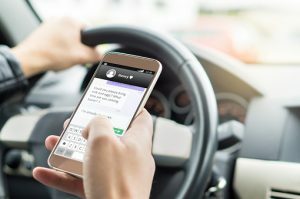 The Times indicates most safety experts believe mobile technology both played a role in bringing the death rate down and played a role in causing the big increase in accidents which occurred between 2015 and 2016. Technology has helped to bring down accident death rates by making it less likely people will get into accidents, and by making it less likely they will die if they do get into wrecks. Airbags, anti-lock brake systems, blind spot monitoring, forward crash avoidance systems, and a host of other technologies have helped bring the death rate way down since the 1970’s. Unfortunately, some of these technologies today, and the increased automation in cars, are making motorists more complacent. Drivers tend to rely more on their cars to pay attention for them and help them avoid collisions… rather than staying as focused as they should on the roads. As we move towards driverless cars and more tech features are added, this is likely to continue turning into an even bigger problem. Of course, there’s also another obvious way that new technologies has contributed to crash risks: it has dramatically increased the dangers of distracted driving. Today, many cars have infotainment systems people can use to do a lot of things hands-free, including talk on the phone and send texts. National Safety Council (NSC) warns that these hands-free systems are NOT risk free! Just because you may not be holding or looking at your phone does not mean your not distracted. Your brain can’t really multitask or jump between activities efficiently, nor can it prioritize effectively between paying attention to the road and talking to your infotainment system to enter an address in the GPS. You need to be aware your brain energy is going to be focused on the wrong thing, which could mean missing as much as 50 percent of what is going on around you. This significantly increases the chances of an auto accident happening. If you cause a crash while you are distracted, you could be held accountable for the resulting damages you cause to others.